Brief video providing a glimpse inside the recent multi-sensory, solo presentation of "Icon Series" paintings by artist Peter D. Gerakaris (January, 2019). Curated by Heather Topcik at The Society for Domestic Museology, the artworks were also accompanied by an original ambient soundtrack by composer Trevor Gureckis & Byzantine-inspired menu by Joel Topcik. Ventana Eden East Study, Gouache, silver leaf, & mixed-media on paper, 20 in. x 20 in. ©2018-2019. Peter D. Gerakaris. a.r.r. After having been exhibited & reviewed by press in NYC, the “White-Faced Owl Icon” commission flies to its new home in Johannesburg (S. Africa), with an intimate unveiling & presentation by the artist (October, 2018). Curated by Dr. Thalia Vrachopoulos for the Anya and Andrew Shiva Gallery. Join Art and Seeking Founder, Lizy Dastin and artist Peter D. Gerakaris for an in-depth dialogue with one of his LA-based art collectors. In this interview, they discuss everything from why the artist loves the tondo format to the artist-collector dynamic, plus an intimate behind-the-scenes glimpse of the "Jungle Oculus Tondo" commissioning process. Ventana 2.0 is a solo project for Google NYC that reconfigures two large paintings from the artist’s Ventana Series – the Eden and Babylon vignettes –into one mural-sized diptych. Please note: viewings by appointment only. Heather James Fine Art is pleased to present “Masquerade”, a special online exhibition featuring the latest paintings by Peter D. Gerakaris. Peter D. Gerakaris' MoonGate Nocturne Tondo I (right) from Umbrella Girl Series, Installation view from Fashioning Art Group Exhibition at The Surrey Hotel in NYC. Also pictured: Chuck Close's Kate Moss tapestry from permanent collection (left) & Evie Falci's Kybele (center) in Fashioning Art. 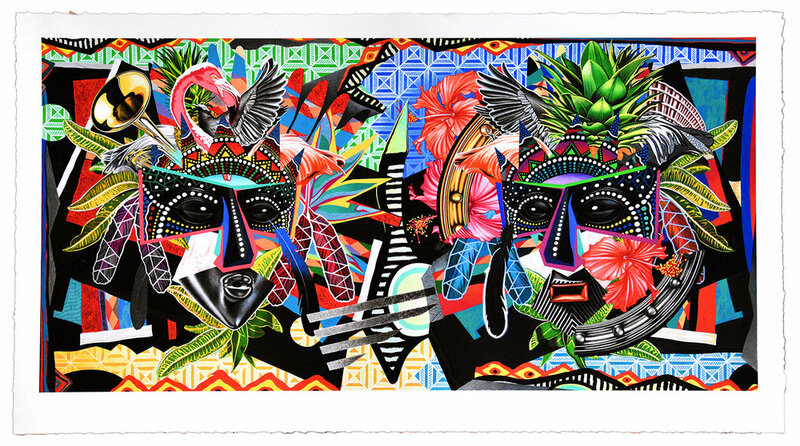 The Armory Art Center is pleased to present Peter D. Gerakaris' latest solo exhibition "Tropicália Remix"